Higher Math in Lower Grades: Hurting or Helping Kids? | Back to Basics Learning Dynamics, Inc.
Every parent wants to see her child keep up with peers, and these days that means taking algebra in the eighth grade. But sometimes we forget that algebra is a very demanding course, full of sophisticated and abstract ideas. Do students really need to take this higher math course in lower grades, or can it do them more harm than good? There are two sides to the issue. Politicians like the idea of offering algebra in middle school. They argue that the world has sped up over the past generation; technology has gotten more complicated, ideas more complex. Why not introduce harder concepts at younger ages? In 2008, California lawmakers began a campaign to make algebra mandatory for eighth-graders, a shift that Gov. Arnold Schwarzenegger compared to President John F. Kennedy’s pledge to put a man on the moon. After listening to these two sides, parents are forced to make a choice: trust the politicians who claim that our children need to take algebra at younger ages, or the researchers who think that our children need to wait. It can be hard to figure out the right path for your child. To get some answers from a hands-on expert, I spoke with award-winning high school math teacher, Jerry Brodkey. Dr. Brodkey has a PhD from Stanford in Mathematics and Curriculum Education, and has taught math for thirty-one years. He had some definite opinions about the move to teach algebra at younger and younger ages. The “normal” track for math classes has shifted down in the past ten years. 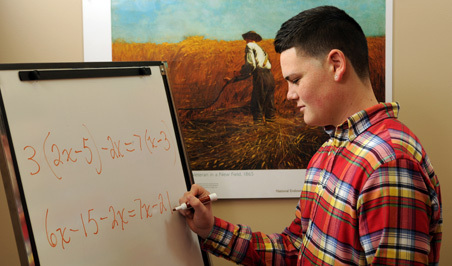 When Dr. Brodkey began teaching, the normal track was for students to take Algebra I in ninth grade, followed by three years of college-prep math. This worked well for most students, and there was always a way for a select group of students to get ahead by taking algebra in eighth grade and advance to Calculus by their senior year. But in the past ten years, Dr. Brodkey has seen “an explosion of students taking algebra in the eighth grade. In the past five years, I’d call it a super-explosion.” The normal track in many schools now has students taking algebra in the eighth grade. The pressure to stay on the new “normal” track pushes students into math classes for which they are not ready. Every year, Dr. Brodkey meets with parents whose freshmen have been appropriately placed in algebra but want to know how they can accelerate their children onto the new “normal” track so they will reach AP Calculus by their senior year. In turn, Dr. Brodkey asks the parents whether the student wants to make this jump, or if it’s a parent-driven decision. He asks them to be careful: “When a student is pushed to take a class for which he is not ready, he rarely acquires a lifelong affinity for math. Instead, he develops a desire to get out of math classes as fast as possible.” He has found that when these students get to Calculus, they can struggle. They can do the first step in the problem, but not the next nine that require solid algebra skills. Parents push their children onto this track because they think it’s necessary for college admissions. The move to introduce algebra in lower grades comes from politicians, not teachers. Like many teachers, Dr. Brodkey questions the motives for California’s campaign for eighth grade algebra: “I think that this push is part of a political agenda to show rigor in the schools. I can’t see how it’s a positive; it’s not a student-centered decision. Any student can learn algebra, but the timing is critical.” Algebra is an extremely challenging course, even more so than Calculus. Teachers introduce a brand-new topic every three or four weeks, and expect complete mastery. Thirteen and fourteen-year-old students are still developing their emotional and organizational skills, and algebra is a course that punishes any immaturity a student may have. Algebra can be taught at lower ages, if it’s introduced slowly. The age at which a student takes algebra must be determined on a case-by-case basis. If you think your child is struggling in any one of these three areas, you can do him a favor by waiting another year before enrolling him in algebra. Placing your child in the right math class will teach him to feel successful and confident about his math skills. But pushing him up when he’s not yet ready can bring on a case of math anxiety that will last for a lifetime.